Binding powers types, table, and accessor. Prefix handlers, types, table, and accessor. Log.Parser.raise_user_error "‘%s’ cannot be used in prefix position." ∣ Token.Float(n) → failwith "Floats not yet handled"
∣ Token.String(s) → failwith "Strings not yet handled"
Infix handlers, types, table, and accessor. Log.Parser.raise_user_error "‘%s’ cannot be used in infix position." Parse an expression with a right binding power of rbp: all infix tokens with a left binding power strictly greater than rbp are part of the current call to parse; other tokens are not. To understand how this works, we put here the stack of calls to parse on the "-a+b*c+d" example. We write parse_i for the ith invocation of parse. We write Ei or (E)i when the expression is created by i. The first invocation calls parse_1 with a right binding power of 0, with the expression "-a+b*c+d" (1st invocation of parse in the stack). parse_1 finds "-" in prefix position. The function associated to "-" calls parse_2 3 "a+b*c+d"
The left binding power of "+" is 1 > 0, so parse_1 continues with "+" in infix position, passing (− a2)− to the "+" handler. The "+" handler then calls parse_3 1 "b*c+d"
parse_3 finds "b" in prefix position. The left binding power of "*" is 2 > 1, so parse_3 continues with "*" in infix position, passing it b3. "*" calls parse_4 2 "c+d"
parse_4 finds "c" in prefix position. The left binding power of "+" is 1 < 2, so parse_4 returns c4. The "*" handler returns with (b3 * c4)*. 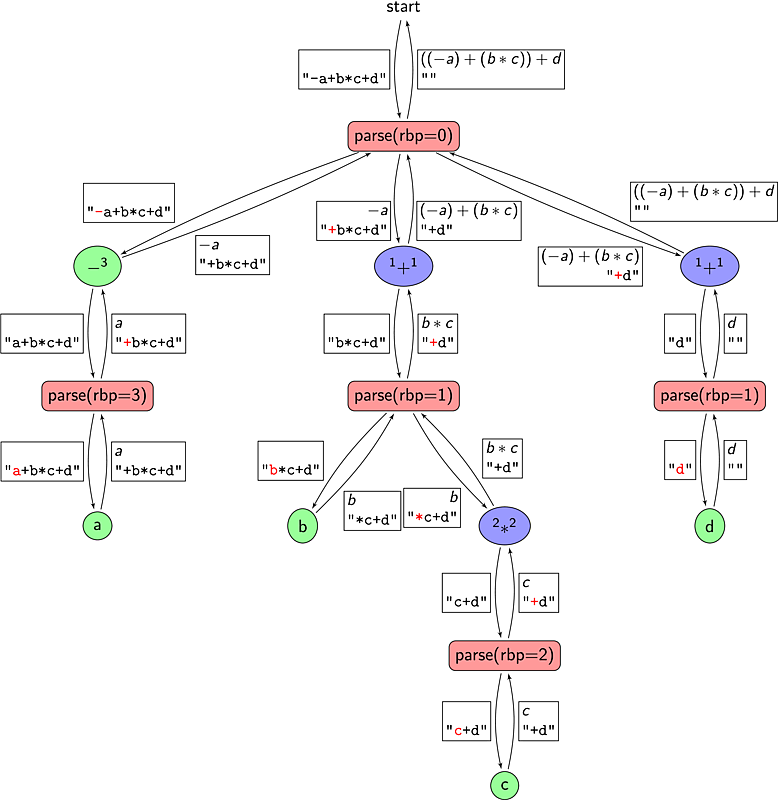 The left binding power of "+" is 1 = 1, so parse_3 returns (b3 * c4)*,3. The "+" handler returns with ((− a2)− + (b3 * c4)*,3)+. The left binding power of "+" is 1 > 0, so parse_1 continues with "+" in infix position, passing it ((− a2)− + (b3 * c4)*,3)+. "+" calls parse_5 1 "d"
Get the first token of the expression, and handles it as a prefix (i.e. as the beginning of an expression). Parses tokens while we find tokens with left binding power strictly greater than rbp. Tail-recursive. Defines a new prefix operator: when token is encountered, the parse function f is called. then Log.Parser.warning "Redefinition of prefix symbol ‘%s’"
General case "infix": a parser is called when the infix token is encountered. then Log.Parser.warning "Redefinition of infix symbol ‘%s’"
Common case infix: the right part is another expression, and the infix operator is associative to the left. Common case infix: the right part is another expression, and the infix operator is associative to the right.